The Professor Layton series has taken off and established itself as a franchise in its own right, so much so that a crossover between it and the Ace Attorney (Gyakuten Saiban in Japan) series is being developed. A movie that’s part of the games’ continuity, Professor Layton and the Eternal Diva, has been released (though not in the U.S. as of yet). 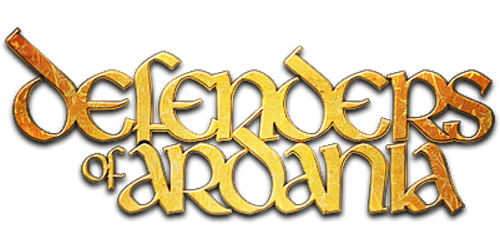 Last year, I reviewed the second game and found it an enjoyable and charming game with a few little quirks. So how well did this game cap off the trilogy? The game begins with Layton and Luke attending a presentation of Dr. Alain Stahngun’s time travel machine, with the Prime Minister Bill Hawkes as the guinea pig. But of course, as we’ve learned from the likes of Chrono Trigger, time travel never goes as smoothly as purported. The machine explodes, with Stahngun and Hawkes vanishing, and scientists going missing as well in the weeks afterward. 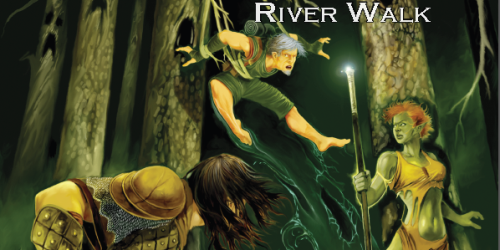 Like its predecessors, the adventure kicks off in earnest with a letter. This time, it’s from someone claiming to be Luke’s future self, who directs them to a clock shop and leaves them a trail to follow. Naturally, our intrepid protagonists venture forth to find out what’s behind the disappearances and the one claiming to be the future Luke. Through the course of the story you get to see other sides of the characters (especially Layton at the end of the game), and it throws in plenty of twists, and then twists those twists along the way. After two games, you can finally learn what the deal is with Don Paolo and why he has it out for the good professor. It’s sort of a letdown, considering you go two games with virtually no hint as to what’s driving his grudge, only to have the reason seem to come out of nowhere and not live up to the buildup. He does at least get more of a role than the comedy relief villain in this game, though. Considering the general tone of the series and the fact that this is the last game in the trilogy, the ending comes unexpectedly and tugs on heartstrings, but it does tie some things up well. The overall visual presentation and art style of the game hasn’t changed much, but it has been polished. There are more cutscenes and stills, which do a nice job of conveying the story. The 3-D effects on vehicles and machinery looks good, and the art style is as charming as ever. Some details in some backgrounds are animated, such as steam coming out of chimneys and gears turning, which make the environments come alive a bit more. The picture books are drawn nicely and unfold like actual children’s picture books, with thick outlines and more muted colors. The soundtrack for this game is generally pleasant to listen to. The music that plays while you’re solving puzzles has been changed, which is a nice change after hearing the same tune during puzzle solving (which you spend most of the time doing) for two games. Like the previous puzzle theme, this one also has the potential problem of wearing on eardrums because of how often it’s heard due to the majority of the game being spent solving puzzles. It’s still a fine track in and of itself, though. For more frenetic situations, the music changes and picks up tempo to suit the situation. The old theme is still present, it just plays in Beasley’s and later Puzzlette’s shack (this game’s equivalent of Granny Riddleton’s shack) instead. The puzzle battle theme is particularly catchy. It’s a shame you only hear it three times in the whole game, as you can’t replay puzzle battles once you’ve gotten past them. The end credits song is rather nice to listen to and compounds the mood of the ending. More scenes are voice acted, and acting ranges from decent to good. 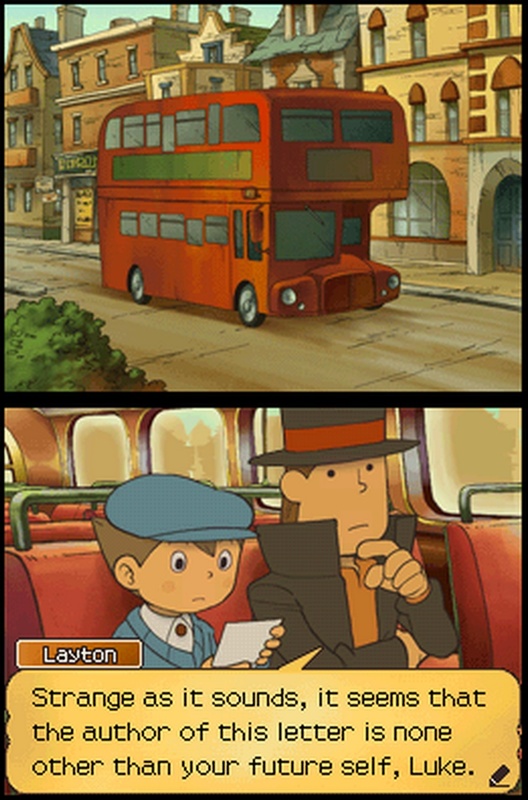 Luke still has his stereotypical British boy accent, and Layton is gentlemanly as ever. Flora seems to have a different voice actress, and I found her new voice to be even less suited to her than her old one. I liked Big Luke’s voice and thought it suited the general gentlemanly air he was trying to exude. Just like the other games, the controls are heavily stylus dependent. The buttons really only come into play as another way to advance through the text if you get tired of poking your screen constantly. To move from area to area, just tap on the shoe in the lower right hand corner and tap on one of the arrows that pop up. 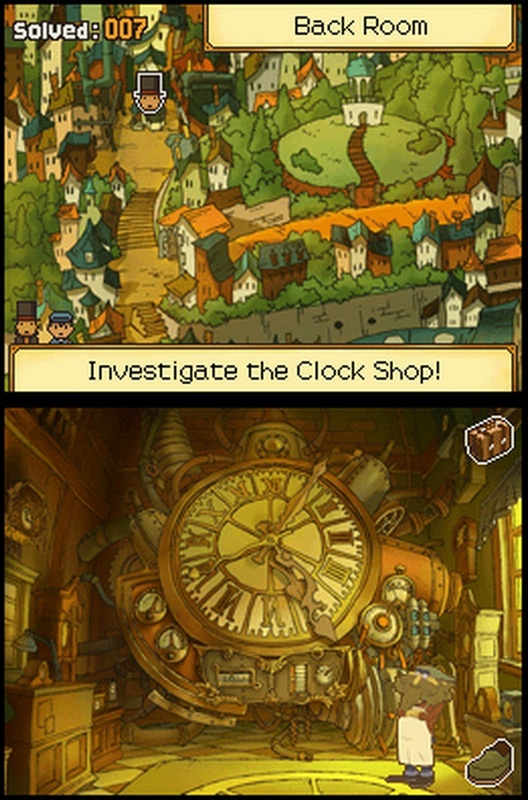 You can tap all around the environments to unearth hint coins, puzzles, or a comment from one of the characters currently in Layton’s entourage. There are some areas you have to tap multiple time in order to uncover something, which is indicated by a different sound and visual cue. The stylus detection generally works well enough with puzzles involving writing a number or letter or moving and rotating pieces around, though at times I’d have to tap around a bit to rotate a piece instead of just moving it. The memo function has received additions – you can now adjust the thickness of your lines, as well as the color. This comes in handy for differentiating between things like different paths or shapes in puzzles. It’s also now available in Layton’s bag, so you can take notes outside of puzzles (or doodle in it). In addition to the three hints, there’s also a super hint. While the third hint of puzzles do tend to all but hand you the solution on a silver platter, super hints not only does that but also basically take your hand and guide you through the first parts of the puzzle, then tells you how to solve the rest of it. New to this game are puzzle battles, which are showdowns wherein a character challenges Layton with a puzzle to solve. 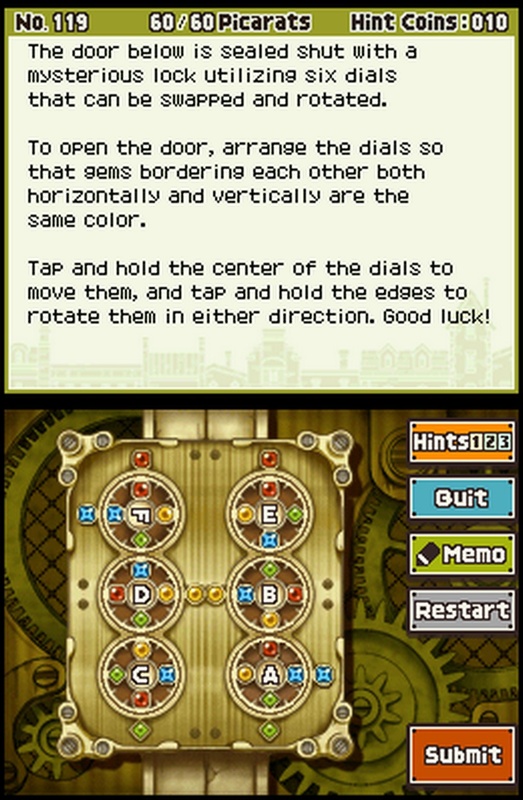 Yes, characters have always presented Layton and his entourage with puzzles, but these do work slightly differently, and come up in more tense confrontations. Unlike regular puzzles, there are no hints, you don’t earn picarats from them, and you can’t back out of them. One of them is similar to the seesaw minigame in Tiny Toons Adventures: Buster Busts Loose. Another works much like a Picross puzzle, so those who’ve played it should be able to figure out that puzzle easily enough. It was a neat idea in concept, and they were fun to solve, but it was disappointing how only one was like an actual “battle” where Layton would actually present his own puzzle to his opponent to solve, you can’t replay any of them, and there’s only three in the whole game. This time around, there’s three minigames for you to complete. One involves picture books with some blanks. You use stickers to fill in those blanks using clues from the text on the top screen. It’s sort of like Mad Libs with pictures and stickers, as the blanks give vague clues as to which sticker to put in which place with descriptors like “[man]” and “[purple thing]”. Placing a sticker in one place replaces all instances of the descriptor with whatever the sticker is (such as “traveler” and “eggplant”). It’s easier to figure what goes where as you collect more stickers and place them, though you mostly have to rely on context and whether the text makes sense with what you’ve put in the blanks. 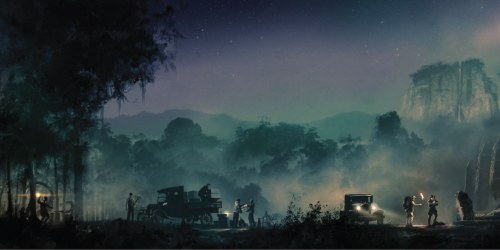 After you completely fill in a book, you can read the whole thing like an actual picture book. They’re all cute little stories featuring characters from the main game (though not mentioned by name). The toy car minigame replaces the hamster minigame and works pretty much the same way. You place different panels to guide the car to a goal. These include directional panels, which cause the car to go in the direction they’re pointing, and panels that allow the car to jump over an obstacle. You can pick which direction the car faces at the onset. However, you have to pick up all the items in the course prior to reaching the goal, which can be a bit tricky on some courses due to how they and the course are arranged. Creating a path that won’t lead the car into crashing and becoming a smoldering heap while fulfilling all the criteria takes some thinking, though you can just keep tinkering with panel placement until something clicks. The parrot minigame entails fulfilling delivery requests from various characters. It bears a small resemblance to Ivy the Kiwi? in that instead of controlling the parrot directly you have to guide it by stretching ropes across two poles for it to jump on, as the parrot can only jump small distances. The parrot also has to reach the person within a time limit. However, you’re confined to one stage, the parrot doesn’t move until you press the “Start!” icon, and there’s no exploration. Ropes placed straight across causes the parrot to jump again, while those placed at an angle will cause it to bounce off at an angle. Being able to imagine the trajectories the parrot will travel after bouncing off a rope (or just brute force experimenting with rope placement) is the key to ensuring your feathered friend reaches its destination. After you beat the game, you can go back and wander around Future London to find anything you missed or tackle any remaining puzzles, though you can’t return to Present London, so be extra vigilant for any hint coins there (missed puzzles get sent to the puzzle shack). There’s more puzzles in this game just in story mode alone than in the two previous games. Solving certain puzzles in story mode unlocks more things for the minigames, and completing the minigames will unlock more puzzles for you to finish (got to love a nice symbiotic relationship). However, once you finish all the puzzles, that’s it unless you feel inclined to wait until you’ve forgotten the solutions and tackle them again. That being said, when you take into account the weekly puzzles, this game can keep you busy for quite a while with fresh puzzles to solve. Like the previous games, it’s impossible for a game like this to be completely balanced because different people will find different types of puzzles difficult, even with a variety of types included. There are some puzzles I find myself solving ridiculously fast – as in, I’d look at the puzzle, go, “It’s XYZ, isn’t it?”, put in whatever XYZ is, and voila, puzzle solved. I’m not sure if that’s due to the practice I’ve had with the other two games or if they’re just getting easier. It’s possible I’ve simply picked up on the way these puzzles want me to think, though some did manage to throw in a twist that rendered my initial assumption incorrect. Some puzzles felt a bit repetitive, like slight variants of each other. Yes, a 6 and 9 both look like the other when turned upside down, I get it already. In addition, the Super Hint makes it even easier for those stuck to get past a puzzle stumping them – and you’re not likely to receive trivia tidbits in exchange for your precious hint coins instead of actual hints this time around, thankfully (even if the trivia bits were interesting). Overall, though, there was enough variety to keep the puzzles from feeling monotonous. Wanting to know what would come next in the story helped keep me holding on to my DS for a good amount of time. However, there did come a point where I’d get tired of twisting my brain into pretzels on some puzzles and want to take a break with something else for a bit. In addition, the puzzles still aren’t all that integrated well into the plot, except for select points. At least at the end of the first game, there was a semblance of an explanation as to why everyone kept presenting you with puzzles. No such thing exists in this game (nor did it in the last game); I suppose at this point we can just assume everyone in Layton’s world is a puzzle fanatic and leave it at that. That doesn’t detract from the enjoyability of this game, but most of the time your puzzle solving feels disconnected from the story progression. Still, they do a bit better with making the puzzles feel like part of the plot at some parts, notably through the addition of puzzle battles. The minigames were also fun to play through, with the picture books being my personal favorite. The Professor Layton series has acquired quite a following since its first release outside of Japan. Given how well puzzle games tend to sell, and the fact that this is essentially a big package of them with a story attached all wrapped up in charm, this game will likely be swooped right up. Considering that another trilogy is currently being made and the fact that he’s also gotten his own movie and will be appearing in a crossover with another popular character, I’d say Layton’s doing quite well for himself. Naturally, the buzz around both will also help move copies. If you still have your copy of Diabolical Box, you can unlock a hidden door section in both that game and this one. Since the passwords are generated by and unique to each DS, you need your own copy of each game and use the same DS for both of them; you can’t just grab someone else’s password. If you no longer have your copy, it’s probably not worth going out of your way to buy another one just for this. But for those that do, this is a nice little bonus for holding onto your copy. 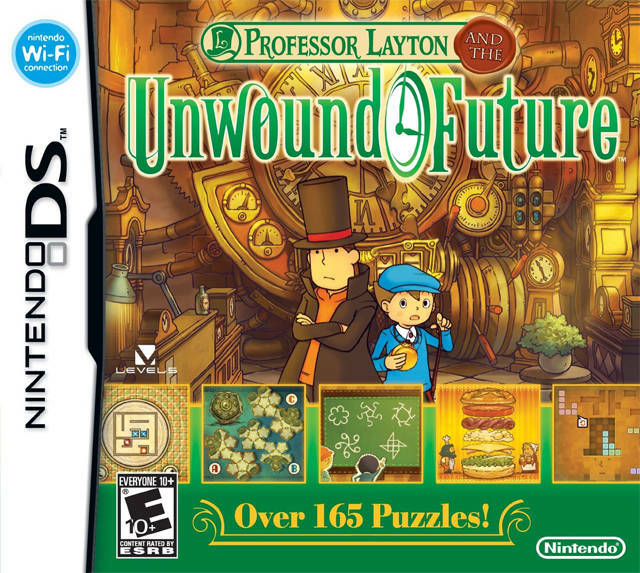 Professor Layton and the Unwound Future topped off the trilogy with a bang. 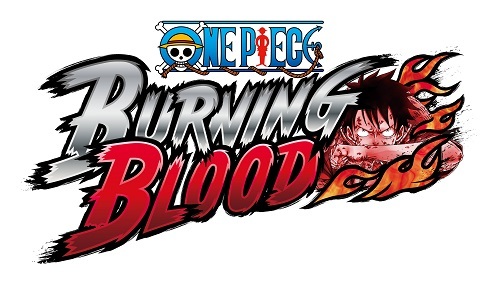 It’s the strongest entry in the series so far, keeping what was appealing about its predecessors and expanding on them. The plot’s charming and compelling enough to get you to keep playing (and the ending might throw you for a loop), though most of your actions still don’t correspond very closely with story progression. There’s even more puzzles packed in, even before you take into account the weekly puzzles, so it’ll be quite some time before you run out of puzzles to tackle.